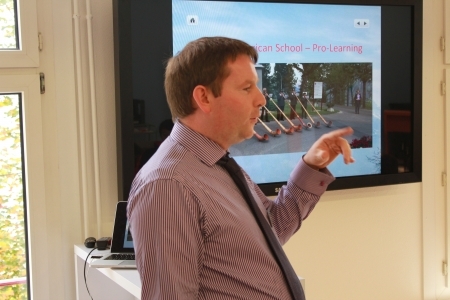 Ronan Lynch is Social Studies Department Chair and teaches IB Geography & Environmental Systems and Societies (ESS). Below is the long edit of his interview. For a short version, click here. Why are you so fond of geography? Geography lets you explore such a wide range of topics. At university I studied under retailers, climatologists, geomorphologists, climatologists, disaster management specialists, Soviet and Eastern European specialists, and more. Eastern Europe had just collapsed, so we had a lot of guest lecturers coming in from the former Eastern Block. One professor from East Berlin lectured on how Eastern Europe would soon cease to exist and would become part of Europe. It was really interesting times. For my masters I looked at the human side of geography, especially urbanization and retailing. At the school where I taught for 14 years before coming to LAS, they put physical and human geography together in blocks. It was similar to the IB course structure we follow at LAS. There are so many aspects for us to study in geography. There’s tourism, there’s the landforms, the human influence on changing glaciers, the glaciers’ influence on humans. There’s a massive spectrum of studies you can do on our local glaciers. Last year at LAS we studied rivers, and this year we’ll focus on extreme environments, including glaciers. We’re right next to glaciers, so we’re eager to do field work on them. Students can actually walk on glaciers on field trips. Since we live very near Glacier 3000, the ski resort where you ski on glaciers right off the lift, it makes complete sense for us to study glaciers. Students could do their Internal Assessments on glaciation. In our geography textbook they recommend that we study far off places like Nepal and Everest. But we have so much right here. This would really fit in perfectly into the IB. Would studying glaciers be instead of the river study that you did last year? Unfortunately, there’s only so much time that they give us in IB. I’d like to do a lot more. If we had geography in grade 10, we could do one big field trip in grade 10, another in grade 11. When students get to grade 12 they don’t really have any time. It’s just not feasible to get more than one day for field work. But I’d love to do both rivers and glacier studies. We can start on the glacier and then follow the stream down to Lake Geneva. ESS is a weird course. Technically the students have to do all the field work themselves, with no advice or assistance. They have to come up with their own project ideas. The other problem with ESS is that every single student has to do a different project. We have 60 or 65 students doing ESS and they all need their own projects. Whereas in geography they can all do the same river study. They can all have the same biome, but when they go out in the field they need to research different elements. Still, there are options. Even a focused ant ecology study can be researched in different ways. In ESS you have 40 hours of lab work you have to do in two years. Each lab is prescribed per unit, so for every unit you have to do a lab. And that’s where all the students do the same work. And then out of that lab, the idea is that they choose which lab they like the best and then they go off on their own take, pursuing what they’re interested in. You can look at who’s doing ESS and geography. There’s an overlap. I have maybe five kids doing geography as well as ESS. So they could do both and then overlap. They can’t do exactly the same project for both subjects, but it’s totally doable to have overlap. Linking these field studies into the curriculum is the best way to do it. When science does its field day, geography can go out on the same day, too. Then we could have pretty much half the seniors or more doing fieldwork at the same time. Half of them might work on a glacier and half of them might work on the LETS study. Tell me about the water study that you started last year? It’s so good when we do a local study. We studied the upper waters of the Grande Eau river that flows in the valley below Leysin. This makes good field work because you can gather data and see changes over time. We used the Bradshaw model, which observes how the river changes with distance downstream. We can also look at water quality and human influence, including to what extent the river is managed. There’s a sewage treatment plant in Diablerets, so we could take before and after water samples, and continue taking samples up at the base of the glaciers, where it’s probably going to be purer. Our students are studying all this in geography. Glaciers, erosion, they’re all part of the course. The have to know the different characteristics of a glacier, its deposition and origin, so studying our local glacier makes it more real for them. It should be really good. And then if we want to a bigger glacier, there’s the Aletsch, a bit further away. The Aletsch is the main example they use in our IB textbook. The textbook asks students to investigate alpine sensitive areas, using the Aletsch Glacier in Switzerland as a case study. We can go visit it in just a couple of hours. How many kids around the world get to actually go to the glacier that’s in the textbook? A colleague in England flies his classes to Iceland just to do this. Look how far they have to go. Some schools go away for a whole week. Ideally I’d rather to fieldwork like this on a weekend because it doesn’t eat into class time. The main issue with our kids is all the sports trips that they’re doing already. The Internal Assessments are mandatory, so we can get the kids released. Some of the students really want to do these field trips because it’s so good for their studies. You just have to book it in on a weekend when not much else is going on. We don’t have many of those. Maybe we could develop a cultural trip for geography and science. We could arrange it a bit like Outward Bound, but more academic. How do you define the difference between citizen science and regular education? With citizen science, like the LETS study, you’re physically involving students with their environment, whereas most education is more lecture style. I think it’s really good for getting student buy in. They get more interested as they get involved, they see how it’s relevant. ESS is really good because it’s always looking at the bigger picture. In the chemistry, biology, and physics classes teachers lead experiments in the lab. Whereas in ESS it’s all about the bigger picture, like how does it fit into the world, what’s the impact, and it’s all about systems and models, so that when you’re studying a unit you’re looking at how and why and what the impact of it is, rather than just the narrow experiment in a lab. ESS is based on a systems approach.